This is installation day for Big Cabinet's shelf! The first thing to do is fabricate the wood blocks for holding the 3/4" PVC tubes in place on Big Cabinet's floor. After that, we will make a paper pattern the shape of the cabinet's floor and use that pattern to saw the shelf to fit the cabinet. Then comes the assembling of the cabinet's components inside Big Cabinet. This is the hard part! George has had to do work inside Big Cabinet before [Rewiring the 12-volt DC electrical power circuit]. It is a very tight fit getting head and shoulders inside! 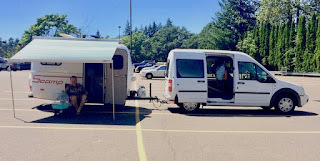 A Scamp owner visiting The Home Depot very likely might find equipment and other things being sold at the giant hardware store that are similar to things found in their own trailer. George has found that stuff being sold at the Home Depot might be much better suited for him than Scampy's original equipment! The following item is not at Home Depot but is something that will definitely go with our kitchen re-design! All of this stuff sits on the big cabinet's floor. It's a mess! For example, in order to turn on/off the inverter, all of the bed things must first be removed! I've been treasuring these last couple of weeks. That's because of the intensity of the work that I've been doing. As you may know, I love doing projects and repairing things sooooo much! I now suspect that this many quality projects may never come my way again. At least not all at one time. This is a very special time for me. The new Renogy Solar Battery Charge Controller that we bought from Amazon is promised to be delivered today. And we on the Scampy Team are sooooo happy about that! In the meantime, we have depended on our Honda 1000 watt generator for electric power. Since this is the first time that we have used the Honda Eu1000i generator we learned about it. The Eu 1000i only produces enough electric power to charge our 12-volt deep cycle battery. But the Eu 1000i does not have enough juice to power our 700-watt electric heater. Or anything else, for that matter! We plan to trade our Honda Eu 1000i generator for a Predator 2000. We have named this day, Honda Day! Without solar, we have only our Honda generator as our source of electric power! #1. Scampy being in the Lake RV shop with some of her lights on for a whole week. #2. The Renogy solar battery charge controller going down. Last nite, both Mac Air and Little iPhone came close to running out of juice! Right now Little Honda Generator is on-the-job of charging up Scamp's deep cycle battery. We are sooooo happy to have Little Honda onboard! It's a bit chilly this morning in Ponderay Idaho. 45℉ outside. And inside Scampy, the temperature is only 55℉. So, we turned on our new Olympian Wave 3 Catalytic Heater. And guess what happened. After the heater was on for three minutes, the safety thermocouple cut out and the heater shut down! We restarted the Wave 3 several times, and every time the heater shut down! Bummer! Our new Wave 3 is defective! We received word from Lake RV that our beloved MsScampy is ready to come home. At long last too! Later this morning, George will check out of the Days Inn Hotel and head over to Lake RV, which is located only one long block away. Lake RV, where Scampy is getting a bunch of work done, has promised that everything will be finished by tomorrow [Friday]. 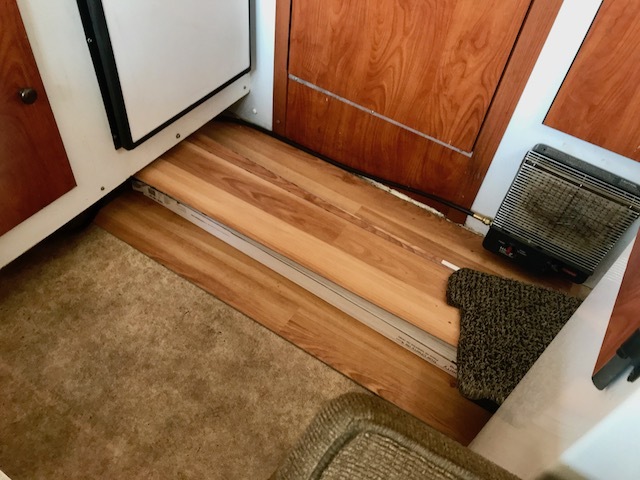 Yesterday, George went over to Lake RV and assembled our replacement Plisse screendoor. The assembly was kind of a mystery until it was discovered that the Plisse factory had placed some of the parts inside small aluminum channels. We guess that putting the parts inside the channels was for safekeeping. But, those parts were disguised when inside the channels and could not be identified. George dropped one of the channels and was surprised when one of the missing parts popped out! Checked Out Two Days Early! Whatta dingbat I am! I checked out of Days Inn two days early. I have definitely lost my mind! Anyway, I am back at Days Inn now. Same room as before. Baby Boid has requested his cage door to be open. He wants to have the run of the place! We want to replace Scampy's tabletop which is made from some kind of particle board composite. At The Home Depot in Sandpoint Idaho, we bought a 4' x 4' good quality 3/4" plywood board which gave us enough plywood for the tabletop and a new shelf inside Scampy's large closet. 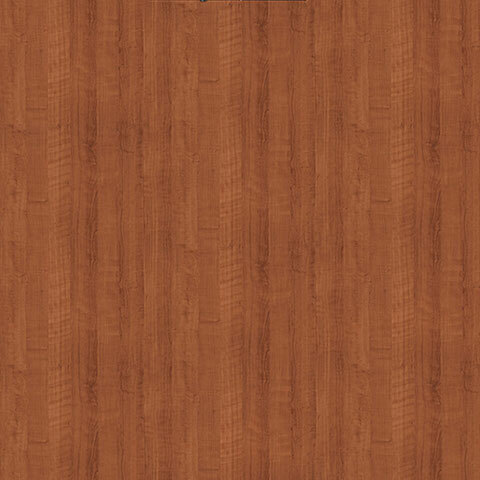 We were thinking about putting a cherry colored laminate on this plywood board. But that laminated tabletop would then look sooooo much better than all of the other cherry colored stuff [Drawer fronts, toilet door] inside Scampy! "Give your kitchen a whole new look." Wow! What a great idea! Now we are thinking about buying laminate sheets to recover all of Scampy's cherry colored door and drawer fronts! The highest priority item to do next is running a new 120 volt AC line. This line will connect the 2000 watt inverter located in Scampy's big closet to a new duplex box which will be located on Scampy's rear wall. George has been giving a lot of thought over the past few days to the easiest way to route this line. The chosen route will go thru the floor of the big closet. Then under Scampy's floor to the area of the bench seat that contains the fresh water tank. Back up thru the floor past the fresh water tank. At this point, the new AC line will be only inches from the location of the new duplex box. The other day I Blogged about the concept of not bussing your table at fast food restaurants. That was a lame idea. Sorry! a person able or employed to do occasional domestic repairs and minor renovations. George woke up early this morning. At 8:30 am. That's pretty early for a guy who did not crawl into his sack until 3:30 am! Of course, the Big Scampy Project immediately popped into George's head. George thought to himself, "How long have we been on this Scampy Project?" "Could it be two weeks? Three weeks? Longer?" Scampy's inside has been torn up forever! Everybody is sooooo tired of that! Last nite, George sat down on Scampy's table. Boom! The table collapsed when one of the table's support brackets let go and the table with George on it fell askew to the floor. George was surprised, but not hurt even a tiny bit. The table was still usable as a base for Scampy's bed. But the support bracket was found this morning on Scampy's floor. Of course, George was delighted to realize that finding this bracket meant a new fixing project for him! If you are a Reader who has followed George's RVing life for a while, you may have come to the conclusion that he breaks stuff on purpose, just so that he can feel the joy of repairing something! This morning at a bit past 4 am I noticed that Mac computer's charger was still charging. That's unusual! Because the Mac had been charging since I went to bed. The battery should be fully charged by now. Looking at the Mac's charging icon I saw that it reported NOT charging! Wow! The charger must be bad! Coincidentally, I had just purchased a backup charger for Mac on August 14th. But I had another Mac charger somewhere stored inside Señor Tránsito, and I went to look for that charger. We are rethinking the feasibility of using the Whirlpool electric refrigerator. 120 volts x 0.8 amps = 96 watts. So, the Whirpool requires 96 watts to operate for 1-hour. And for a whole day, 96 watts x 24 hours = 2,304 watts per day. Our Yingli solar panel is rated at 250 watts. How much power does a 250-watt solar panel produce? 250 watts x 4 hours. That's 1 kWh (1,000 watts) in a day for our 250-watt panel. Even on a good summer day, our Yingli does not produce enough electric power for the Whirlpool. We are short 1,304 watts/day. Note: Are these calculations correct? This morning, the Scampy Team took a second look at the proposed installation of the Whirlpool fridge that we wrote to you about in yesterday's [6:48 pm Blog post]. The main advantage of the Whirlpool electric fridge is that cooling is mostly not affected when the weather turns hot. Also, the Whirlpool has a freezer compartment! 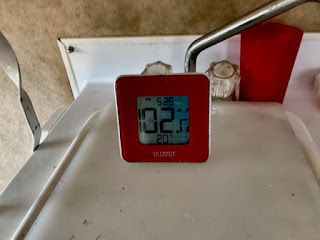 This compares to our Dometic propane fridge which is very much affected by hot weather and can easily have an internal temperature greater than 50℉ when the weather turns hot. However, we must admit to ourselves, that the Whirlpool's advantages just do not outweigh the disadvantage of the Dometic fridge's high temperature when the weather turns hot! The Whirlpool electric fridge may require more power than is available from solar at some times of the year. We do not want to chance not having refrigeration. So, we have abandoned the Whirlpool electric fridge idea and are sticking with our Dometic fridge. I'm in the process of negotiating with Lake RV of Ponderay Idaho to make several changes to Scampy. Tomorrow I will be talking to Orville and Sharon Bayless, the owners of Lake RV. After talking about what is to be done, I will be able to post here in my Blog about the details. A few Readers have commented their concerns that the filler tube for Scampy's fresh water tank is sitting crooked in yesterday's Blog pic. I believe that I will be able to rotate the entire tank so that the blue hose will sit square. When I have completed this rotation and remounted the filler tube, I will post an updated pic. I have decided against rotating the fresh water tank as I Blogged about in the 8:07 am post above. In my opinion, the tank and its connections are more than adequate. Yesterday evening at about 10:45 pm, the Scampy Team drove to a gas station in order to test our re-worked Fresh Water Tank tubes. While the tank was filling, everybody was watching the water level rise with bated breath! Of course, we all concentrated on the filler tube. Was there a sign of a leak from the filler tube? There was no sign whatsoever of a filler tube leak! Yaayyy! We usually cut the water filling before the fresh water tank is fully filled in order to prevent a leak coming from the vent tube. But that was before the new vent tube was installed. But right now we wished to test what happens when the tank is completely filled and incoming water is forced up the vent tube? We let the tank water to flow out the vent tube for about 1/2 minute. When no leak from the vent tube could be seen, the vent tube was declared a complete success! Wow! Man-O-Man. Double Wow with sugar on it! When all of Scampy's things that were removed for the Vinyl Plank Flooring project were re-installed, there was still a lot to do. But the remaining "to-dos" may be completed at our leisure. Except for one important item. That item is the fresh water vent tube! We all know that George commented against needing that vent tube. And many Readers sided with Mister Ed who wrote that the vent tube was necessary. The weather report for Missoula Montana showed 97℉ for the temperature. But, inside Scampy, as you may see in the pic below, it's 102℉! When Little iPhone captured the temperature pic, George and Baby Boid were both outside under the shade of Scampy's awning. The temperature was high in the shade too! Boid said, "It's too hot! Let's all sit inside Señor Tránsito with the air conditioner on high!" 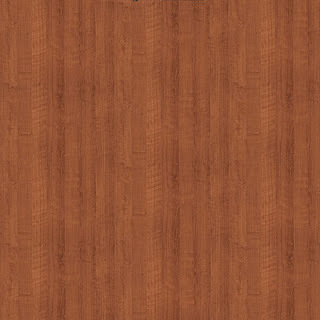 During the nite, I thought about how to lay the different sections of the vinyl plank flooring. Each section presents a different way. I figured it all out! Laying the flooring will turn out to be the easiest part of this floor project! I believe that I also figured out where the leak is coming from the fresh water tank. There is a tube which is there for either overflow or for a vent. Neither of these functions are necessary for this freshwater tank. 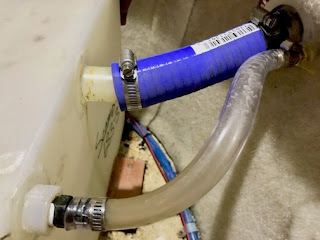 If this tube is plugged up in some way, the water will no longer leak from it! Little iPhone captured a view from Scampy's rear window of the Clark Fork of the Columbia River. 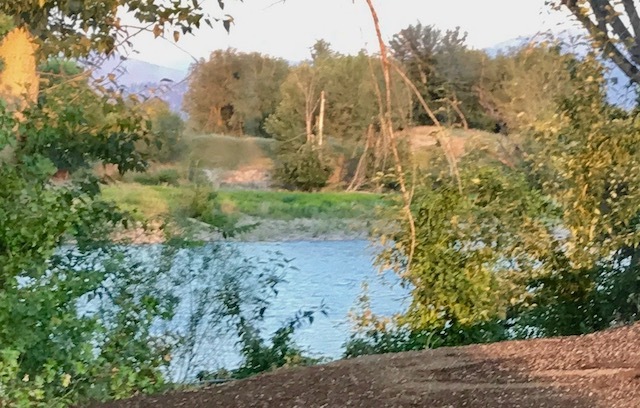 The Clark Fork flows only about 30 yards away from our Nite Camp. The original name given by the Lewis and Clark Expedition was Clark's River. Clark Fork River viewed from Scampy's rear window. Yesterday I tried to use iMovie to edit a video about Señor Tránsito's tail lights. As I Blogged to you yesterday, I cannot figure the iMovie thing out. This morning, before dawn, I began working with iMovie again. Same problem. I finally edited that video a little while ago, and published it too. Would you believe, that I still do not have iMovie video editing down solid! Anybody who says that iMovie is an easy program to use must be living on a different World from the one I live on! We are heading out of Helena, the State Capitol of Montana this morning. Bound for the City of Missoula. We have decided to take the northern and longer route. This is the way less traveled by. Who knows what adventures await us on this other road. And perhaps this one decision shall, in our years to come, make all the difference. Tioga George has been Camping on the Street since he first brought MsTioga home on February 25th, 2003. Some things make street camping so very attractive. But, before listing those things, it is necessary to state that Camping on the Street is not legal anywhere in the United States. Of course, in the Scampy Team's opinion, just because street camping is not lawful, does not make it wrong. ➜ You travel where you want, not where an RV park is located. ➜ No rent to pay. ➜ No reservations to make. ➜ An RVer may camp anywhere they happen to be at the time. Please feel free to add to this list using a comment. Your name/handle will give you credit when it is in the list above.